Our paper describing a new bioinformatics tool—and to showcase the software, a very detailed investigation as to how inner ear hair cells assemble their hair bundles—appeared in Cell Reports on June 5, 2018. The creation of the CellTrails tool was supported in part by Hearing Health Foundation’s Hearing Restoration Project (HRP) but moreover, it is the product of recognizing existing limitations of data analysis, going back to the drawing board multiple times, and finally getting to a “product” that is going to be the workhorse to analyze a good part of the bioinformatics data that the HRP has been accumulating for years. 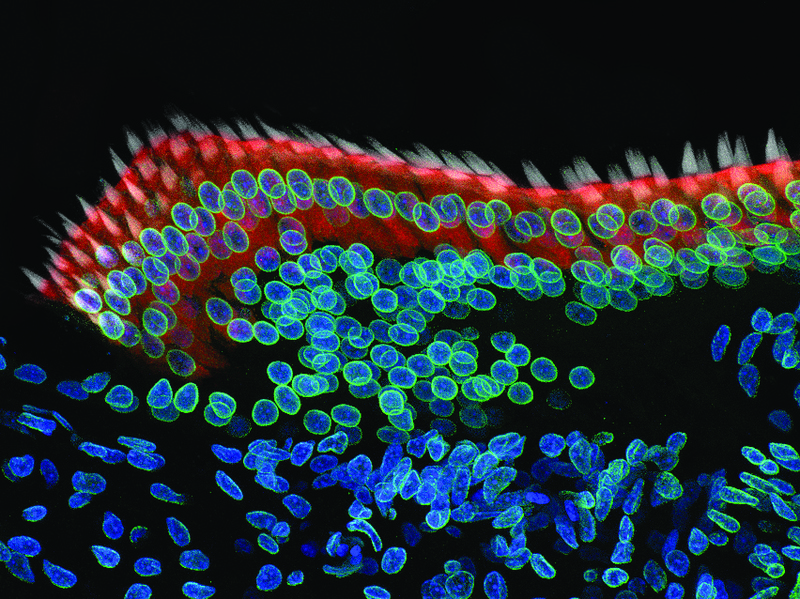 An image taken at 40x magnification using a confocal microscope in the Stefan Heller lab shows a 7-day-old chicken cochlea. Credit: Amanda Janesick, Ph.D. The ideas came from conversations between HRP scientific director Peter Barr-Gillespie, Ph.D., and me and our getting stuck with trying to make sense of all the data—so the tool is the direct product of interactions through the HRP. It follows on our work utilizing single-cell gene expression analysis to examine the genetic instructions allowing individual cells to differentiate (change) into other types of cells, such as inner ear supporting cells that turn into hair cells in species other than mammals, and thereby restoring hearing. The tool helps us pinpoint where specific single cells are located in an organ, and their trajectories as they undergo transformations, information that was lost or fuzzy before. With it we can create a more robust, visually rendered gene expression landscape. Two postdoctoral fellows in my lab were instrumental in CellTrails: bioinformatics researcher Daniel Ellwanger, Ph.D., the tool’s primary developer, and Mirko Scheibinger, Ph.D., who validated its predictions. I truly feel that the seeds that were planted years ago are now growing into sizable plants—we have a massive "chick regeneration inner ear plant” that is starting to thrive! Find the tool at hellerlab.stanford.edu/celltrails. Stanford University’s Stefan Heller, Ph.D., is a member of HHF’s Hearing Restoration Project, where Oregon Health & Science University’s Peter Barr-Gillespie, Ph.D., is the scientific director.